How to promote your free forum? Research and Discover your free forums subject. Use a forum skin that appeals to all. Affiliate with other forums based on the same subject. First of all, if you’re looking for a forum host to start with go straight to www.forumotion.com, that will offer you the best free service out there! Research and Discover your free forum subject. Yeah, it’s nice to be making loads of free forums with different subjects, however, when creating a forum - you need to take some thought over what it’s going to be about. People dream of having successful free forums, yet they make it appeasing to themselves and not to others, I've seen forums with about three gaming subjects that don't have anything to do with each other. And this forum, has ironically failed. So, when creating a forum, make sure it’s something people are interested in, and it’s not just set your personal preferences. Try to make it off of something completely original, which no one uses, or has used. It’s very difficult to compete with already established sites when you are just starting out and don't have much to offer. So, example: rather than making it of a Wrestler such as Triple H, Shawn Michaels, The Undertaker, etc. Make it of lower level stars which you don't hear much about - new and upcoming stars is your best choice. Other examples, Instead of making a phpBB support forum (where you’re clearly going to fail because of the official support board) make something like Hacks, and base it all off that subject. You also want to make your board have something original, that no other board offers, content just for your board. Once you find the subject you like, go at it hard, and make sure to dedicate time, update regularly, post regularly, etc. Loads of Forums fail because the owner doesn't dedicate time. Ideally, you want to get advertisements with the same topic or the same relevance as your forum, e.g. If you make a Wrestling forum (based on a Superstar) you could catch affiliate with (other) superstar based websites, as well as general wrestling websites and on occasion maybe sports sites. You should stick to the genre your forum is, and not sway off just to get “dull” members. When making free forums, especially in its starting stages you want to have a skin that appeals to guests. 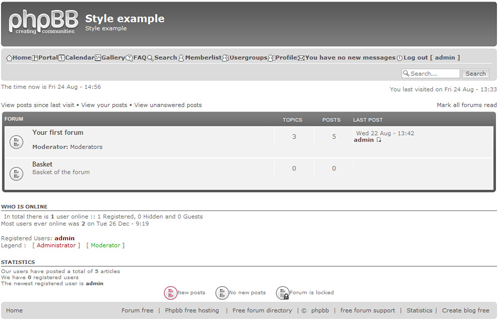 A perfect example is phpBB's prosilver skin; that is a nice style and it is very appealing to members. If you could however find a style that adapts to your free forums subject: such as a gaming site, you ideally want to use a Gaming-esque style. Creating an “atmosphere” where your members feel comfortable is one of the key success points that no-one hardly ever thinks about. With these steps, hopefully they can help you on your way to making a successful forum.